Alliance Tournament XIII – The Rules? AT XIII should be announced in a few months—this article is a summary of my thoughts on how the rules need to be changed to make things more interesting for both the viewers, and the teams participating. Let me explain the thinking behind a lot of these changes. 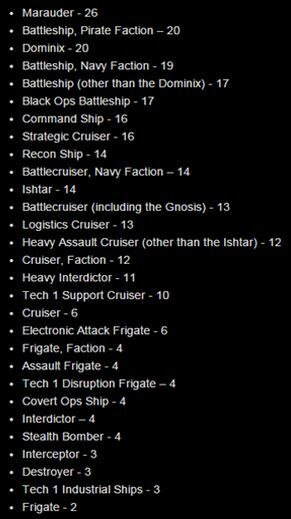 Compared with the AT XII list, these ship point values go right from one to 19. Having done a lot of tournament theorycrafting, it is really frustrating having to ditch a promising looking comp because you have leftover points that you simply cannot use. Making a 12 man team mandatory would require a spread of ship point values, and that’s why I have done so here. Another major change from the standard CCP ruleset is that I have made battlecruisers and battleships significantly cheaper. I have knocked a point off most battleship classes to make them more attractive to use as their current point values reflect a time where brawling was the dominant meta in EVE tournaments. Two potentially overpowered battleships in the Armageddon and the Dominix are significantly neutered by the Tech I drone restriction, but will still be a great value at 16 points. Battlecruisers basically saw no use in the last couple of ATs, other than the occasional Gnosis, Prophecy, or Myrmidon, which unsurprisingly are all drone boats that fitted warfare links at a cheaper cost than a command ship. With cruisers at 7 points and HACs at 12, battlecruisers will hold an interesting middle ground that will allow you to get a cheap tanky damage ship in your comp that also allows the use of warfare links. Navy battlecruisers are also super weak as a class and deserve a bit of a discount. Making them the same point value as HACs will give theorycrafters some interesting options at that price point. Cruisers have been split into several distinct classes with their own point values. Pirate faction cruisers with their pseudo-recon bonuses have been reduced to 11 points to differentiate them from, arguably, the stronger HAC ship class. Navy cruisers are much weaker in power and have been split from pirate cruisers with their own point value. Having them at 12 in the original rules was kind of silly, and they basically never saw any use due to being in an overstaffed points bracket that was full of far more powerful ships. The Vexor Navy Issue will no longer drag down the class due to the Tech I drones rule. Nine points fairly reflects their power level, meaning you can get a Tech I cruiser upgrade for a few points, or a large upgrade to pirate faction for four points. Speaking of cruisers, I’ve made them slightly more expensive at seven points, as at six they were simply too cheap and brought far too many slots to a comp for that price point. Tactical destroyers are fair at six, especially with cruisers at seven, and should provide good value for teams that choose to field them. EAFs are a point cheaper with the restrictions on the Keres curbing damp power a bit. Frigates have undergone few changes from the CCP rules. I put in exploration frigates at one point, meaning teams have interesting platforms for unbonused EWAR at a cheap price on a series of flimsy hulls. I also split navy frigates from the crowded four point bracket. and set them at three points to ensure they actually have a chance of getting used. The Alliance Tournament is a lot of work for both the players that are participating and for CCP, but is honestly one of the most intense and rewarding experiences you can have in EVE Online. Keeping that experience fresh for players and for viewers by having a set of rules like I have suggested in this article will go a long way towards revitalising interest in EVE tournaments. I hope CCP takes note and chooses to incorporate some of the ideas presented to make it a much more interesting and exciting exhibition for all. Thanks to Kadesh Priestess, Bluemelon, Wild things, and the rest of the Camel Warlords for being a sounding board and suggesting many of the ideas in this article.